In the modern world where musicians think they are- by implication- actors, and vice-versa, it is intriguing to note that this ‘cross-pollination’ is by no means a new concept. Ivor Novello, however, could both act and sing. He could also write (his prolific output running to an estimated 250 songs, several plays and even dialogue- most bizarrely for Tarzan The Ape Man (1932). Classically handsome, Novello’s influence is seen most today in the eponymous music award named in his honour and also for his chilling appearance in Alfred Hitchcock’s The Lodger (1927). Sunrise Silents are not willing to restrict public awareness of Novello to these two aspects however- their release of 1928 adaptation of Noel Coward’s The Vortex proving that Novello’s masterful performance for Hitchcock a year earlier was no freak success. Playing Nicky Lancaster (as did Coward himself in his play’s first appearance), Novello’s eyes and face are particularly suited to the visual nature of silent cinema as it reached its zenith, although director Adrian Brunel does not fully utilise Novello’s physicality to a sufficient degree. The film itself is a real curiosity, for it builds on public appetite for Coward’s work in the 1920s which led to the first adaptations of several of his plays only a few years after they were first written and performed (The Vortex was written in 1923 and first performed a year later). Thus, it is a valuable survival in its own right for this very reason. The film is, though, not particularly successful- Coward’s superb dialogue is limited to intertitles (which are occasionally amusing but lacking the bite verbal interplay would provide), whilst some of the finer points are lost midst the not dissimilar appearance of several cast members. The references to both drug-taking and homosexuality which helped make the play so controversial in the early 1920s are still present in the film, but partly hidden under a veil of visual ambiguity and uncertainty. It is this visual aspect of The Vortex that is only partially by Brunel’s film- the mise-en-scene is, again, not utilised to its fullest degree. 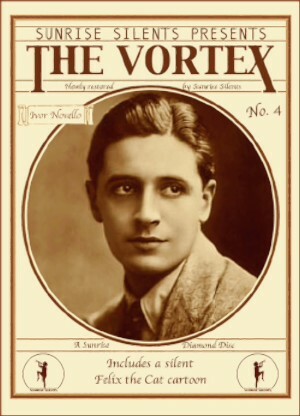 Despite the shortcomings of the actual film, the restoration and release of The Vortex are to be applauded for three main reasons- it is an early adaptation of a Noel Coward play, it features a performance by Ivor Novello and it has survived. This last reason is perhaps the most telling- a film such as this would stand no chance of ever being released were it not for a company like Sunrise Silents, who seek to raise awareness of silent film beyond the examples known to most casual fans of pre-talkie cinema. This particular edition of The Vortex is beautifully tinted, and is not the work of an enthusiastic amateur- it is the work of a enthusiastic professional. The supplementary short animation- Felix The Cat Hits The Deck(1927)- is a superbly inventive little film, concise and charming, which lightens the mood after the sometimes strained ambience of The Vortex. Overall, Sunrise Silents are to be commended for presenting such a rare title as The Vortex, whatever its cinematic merit. That it exists is a triumph, not only for the historical interest but for its use of the original matinee idol playing a part that truly made the name of another leading light in the popular culture of the 20th Century. The Vortex(1928), directed by Adrian Brunel, is available on DVD from Sunrise Silents.